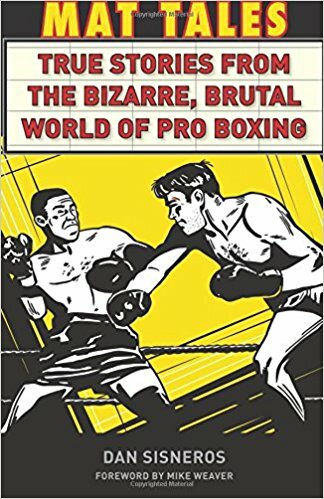 One of the first releases from Pulp Hero Press, a blood relative of Bob McLains’s awesome Theme Park Press, Mat Tales is good little look at some of the weirder things that have happened in the boxing ring. Compiled by Dan Sisneros, a feature writer for ProBoxing Update and a former boxing judge, the book recounts some of the things that he saw happen. We are treated to recounting of the Mitch Greene Mike Tyson street brawl, the infamous Fan Man who crashed the second Riddick Bowe and Evander Holyfield fight fight, Bowe's battles with Andre Golota and the blink and you'll miss it Crawford Grimsley James Thunder fight which answers the question, how short can a fight be? Once I got past the slight disappointment that this was not going to be larger compendium of ring weirdness I fell in love with the book. As a longtime fan of the sweet science I witnessed a number of the events myself on TV. Some I remembered and some I didn’t. Once you’ve seen the Fan Man incident you can never forget it. Intrigued by many of the reports of fights I hadn’t seen I found myself bouncing back and forth to Google to try and run down video of the incidents. Talk about stretching your time with a book…. This is gets better and better the farther into the book you go. I had a blast reading Mat Tales. While it may not click with all audiences, for anyone who has any interest in boxing the film is worth getting. It’s a great deal of fun. Best of all it makes you hope that there are going to be more volumes.